As promised I am going to write about each dessert I did for the Spier Secret Dinner, starting with the one which I got the most excited praise about. I discovered this dessert while I was in Norway. In-spite of my reservations, based on a previous dislike of rice puddings, I was totally won over. My boss made it for the family and we ate it warm with butter, cinnamon and sugar and it was sublime. Lisbet, my boss's wife, is Danish and she told me about how they eat this dessert at Christmas. 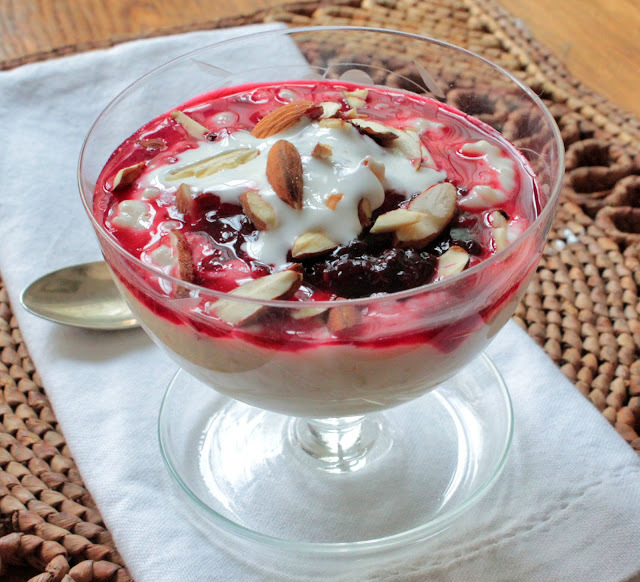 They add vanilla to the pudding and eat it topped with a cherry compote and flaked almonds. Retha Erichsen who hosted the Secret Dinner is, as the name suggests, of Danish descent and remembered this dessert from her childhood. They ate theirs with a rhubarb compote. This was enough reason for me to experiment with my own version of it and serve as one of the three dessert with our nostalgia theme. The recipe is a complete improv from my side and may not even vaguely resemble a traditional recipe, but trust me (and the guests who attended the dinner) it tastes amazing. In a medium size thick bottomed pot heat the milk, salt and vanilla together until just before it starts simmering. Add the rice and stir continually and slowly until the milk starts to simmer again. Drop the heat so that the milk stays at a consistently very low simmer. Keep stirring the pot gently; running the spoon or spatula along the bottom of the pot to ensure that neither the milk nor rice stick or catch as this will burn and ruin the dish. This part takes patience and persistence if you want the perfect rice pudding. You can leave the pot for a minute or two at a time but do not stray far. 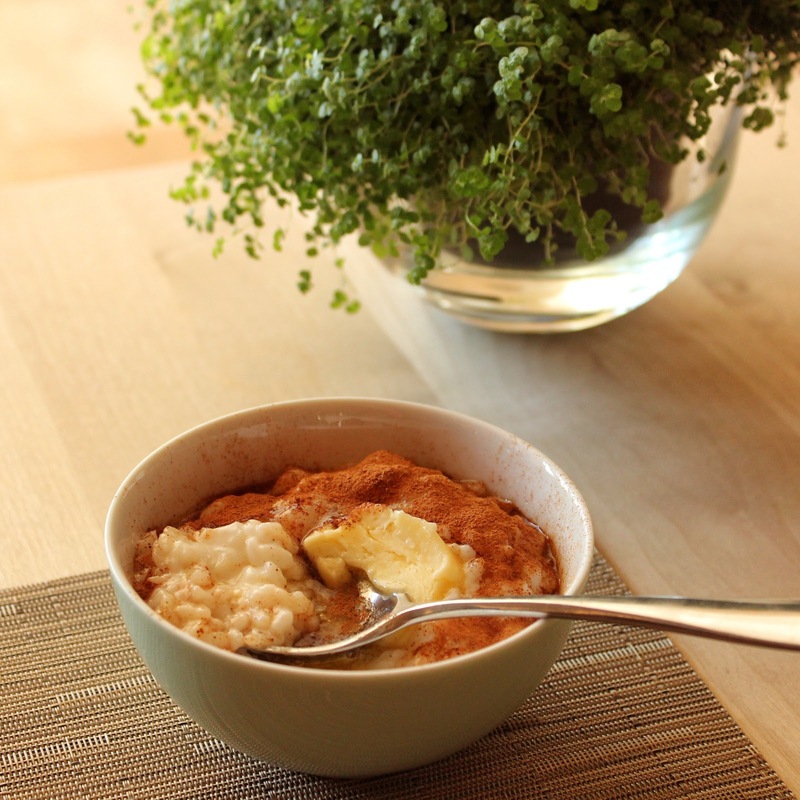 The pudding is ready when the rice granules are soft and the milk is creamy between the granules. This will take about 45 minutes to an hour. Once you remove it from the heat, it will continue cooking a bit further so don’t make the pudding too mushy before taking it off the heat. Stir in the sugar and allow the pudding to cool. In a medium sized bowl combine the berries and the second half a cup of sugar. Set this aside to defrost or microwave on defrost mode until the berries are soft. Stir to combine the berries and sugar. Refrigerate until ready for use. To serve, you can serve both the pudding and berries cold, or can you serve the pudding warm with cold compote on top. Both the pudding and compote can easily be made the day before and stored in the fridge. If the pudding is too thick or sticky add milk or cream until it has a nice soft texture. Divide the pudding between as many bowls as you have guests, top with the compote, then a dollop of softly whipped cream and garnish with flaked almonds. As much as like the berry compote version I would always keep some aside to eat warm with butter and cinnamon. Nice to have desert, which depending on the temperature, can work for summer or winter. And yes, I can attend to the yumminess though growing up with Mueller Milch and rice pudding in a packet, I was never a fan before. Noted! I have somewhat of an addiction to salt and would add it to my breakfast cereal if my husband didn't stop me. Am already dreaming about my next visit to Scandinavia! Love your blog by the way. You are sweet, and I haven updated it...........now I feel bad ;-) I will try and do something about it. Good guy, him Adam, I used to have bit of a salt addiction myself.